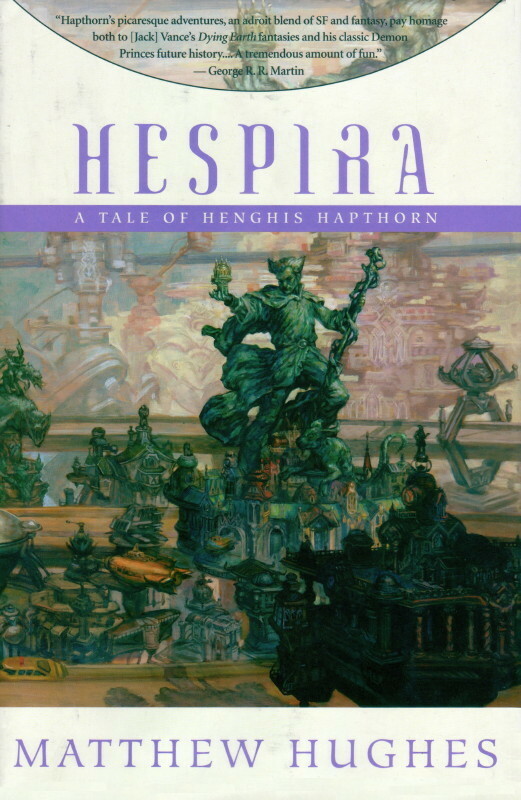 Hespira is the third in Matthew Hughes’ novels of his Sherlock Holmes-like protagonist Henghis Hapthorn, the greatest discriminator of his age, but an age of science which is drawing to a close, to be replaced by an age of magic. The book opens with Hapthorn getting involved in a dispute between a rich collector and a criminal overlord, at which point the chief of police (the Scrutinizers or “Scroots”) suggests that Hapthorn take a vacation until it all blows over. Conveniently, Hapthorn has recently run into a young woman, Hespira, who has lost her memory. Hapthorn seizes this opportunity to get off-planet while also pursuing a case that seems likely to challenge his mental abilities (even if it might not pay very much; then again, he’s rather taken with the woman). Hapthorn and Hespira journey far down the Spray of human civilization to a remote world in search of her origin. When she had brought me the platter of pastes, the server had pointed out to me the different strengths of the eighteen sauces, advising me to save for last the meat puree doused in Sheeshah’s Nine Dragons Sauce, predicting that one it struck my palate, the dish’s other, subtler flavors would be unable to register. I now scooped up a good pinch of the stuff, made sure my tumbler of improved water was full and to hand, and popped the laden bread into my mouth. There was a pause – my taste buds may well have gone into shock for a moment – then the full weight of Master Jho-su’s genius crashed upon my senses. My eyes widened, simultaneously flinging a gush of tears down my cheeks, my tongue desperately sought an exit from my mouth, and my nose and sinuses reported that they had been suddenly and inexplicably connected to a volcanic flume. I groped for the tumbler and took a healthy gulp, but the water seemed to evaporate before it even reached my throat. I drank more, my free hand finding the carafe even as I dained the glass. I could scarcely see to pour a refill and ended up drinking directly from the larger container. Gradually, the inferno in my mouth subsided to a banked fire. I wiped my streaing eyes and sucked in a great breath and would not have been surprised, when I exhaled to have emitted clouds of steam. Throughout Hapthorn’s adventures, Hughes has changed the status quo of his hero’s life several times. Hespira opens with Hapthorn in a period of relative calm, without the disruptive presence of his doppelganger, Osk Rievor, who is Hapthorn’s intuition given form and who now lives separately. The adventure in the meat of the book is clever and entertaining, with Hespira an unusual foil for Hapthorn since he’s attracted to her, and she’s amnesiac but strong-willed. Untangling the threads of her life is what Hapthorn does best, even without his intuition, and seeing him at his best once more makes for fine reading. But the impending end of his age of science and reason worries at Hapthorn’s soul, and while the adventure here is a distraction from his problems (and, amusingly enough, a distraction in other ways as we find out in the novel’s climax), eventually he returns to the problem of what to do about, well, the transition he can’t do anything about. The book ends in a somber note, which is a bit disappointing if this really is the last Hapthorn novel. On the other hand, Hapthorn has never been a very heroic figure; while he’s not simply a mercenary, he’s always been timid and even a little craven, so the decision he faces at the end of the book and the fact that he can’t actually decide is (unfortunately) in keeping with his character. But it’s always been a little ambiguous as to when the turn of the wheel is going to descend, so it’s sad to leave him at this point, not sure if he’s going to give up, or give in, but in any event ending his career with a personal whimper rather than a bang. But, I guess there are people who do that.